Joe invited me to bow hunt with him on Wednesday, November 11th. Prior to that, a buddy stopped by my shop and told me about some New York based deer scents he'd been using that had been very effective for him. He suggested I use some of their scent the next time I went hunting, since the rut wasn't fully underway. When I got to Joe's place, I put some scent on a drag line and made a trail as I walked to my stand. I hadn't been sitting more than 35 or 40 minutes when I saw a buck - about a 130 class 10 pointer - following my scent trail, nose to the ground. It was coming in from right to left. When it got about 42 yards out, the buck veered off the trail and stopped behind a thorn bush. I decided to take the shot, but he wouldn't move. After what seemed like a long standoff, I tried to send an arrow through the little opening in the bush into his vitals. My arrow hit a small branch, deflected and stuck in the ground in front of the deer. He immediately ran back to where he had come. A friend of mine, who was in a stand about 150 yards up the trail ended up shooting the buck. When all was said and done, I was kind of glad I'd missed because the rack had a couple of broken tines and didn't carry much mass. Later, I asked Joe if we could hunt the following weekend, and he invited me back for Saturday afternoon, November 14th. On my way to the property, I picked up another bottle of scent, this time estrus doe. The rut was starting to kick in with a little more intensity. I made another drag line going to my stand. When I reached it, I also set out a few scented wicks. I got settled in around 2:30 pm and did a loud rattling sequence. I followed up with a few grunts. Ten minutes later, I heard something coming from my left. It was thick that way, so I couldn't see much. Finally I saw a buck walking through the woods about 60 to 70 yards out - this time from my left to my right. When he got to the ATV trail I walked in on, he immediately put his nose to the ground and started coming toward me. I couldn't believe it! The buck went a short distance, broke off the main trail and stopped behind a large oak tree. There was a small opening in the front of it. Beyond that was the same thorn bush that the other buck had stood behind three days earlier. I planned to shoot the deer as soon as it hit the opening. I normally hunt with a compact hunting bow. However, this hunt I decided to use a more forgiving bow in case I had a longer opportunity. I came to full draw for the 42 yards shot. As I drew, the bow's bottom limb hit the edge of my stand, making a loud PING! Briefly distracted, I looked down. When I looked back up, the buck had already stepped through the opening and was standing behind the thorn bush. I had a good shot at his vitals, so I let the arrow go. But when it got to him, it deflected slightly and went forward into his neck. The buck ran and stopped about 90 yards away. I tried to grunt and lure him back, but he wouldn't respond. I looked up and saw the dead buck against a tree that had been rubbed raw of it's bark. I'm not sure if the rub was the bucks handiwork or not. We walked up to the buck and couldn't believe how big and massive the rack was. His eyes were glazed over, his tongue was hanging out, and he was motionless. We stood talking for about a minute, then I reached down and grabbed the huge antlers like I'd done many times before. To our amazement, the buck immediately tried to stand up. I held on to the antlers and yelled for Joe to put another arrow in him. After what seemed like minutes - in truth only a minute or so - Joe was able to put an arrow through the deer's heart, ending the drama. In a lifetime of hunting whitetails, I'd never had anything like that happen. 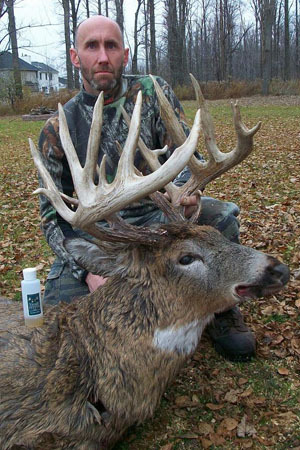 Dan's 17-point, Orleans County, non-typical goes into the official New York State Record Book at 183-2 B&C and grossed a whopping 195-1 B&C.